The Art of Choosing Gift Wrap: A 4-Step Guide to Picking Materials — Gift Horse + Co.
You know what a lot of people have trouble with when it comes to wrapping presents? Choosing materials. It’s not that they can’t find a pretty paper or ribbon they like; they just tend to freeze when they try to put together a complete look. “How do I know what goes together?” is one of the most common questions I get. Yes, some people have a knack for pulling together stunning combinations, but that talent can take years to hone through trial and error. And just because it comes naturally to some, that doesn’t mean it’s something you can’t learn. Where do you start? 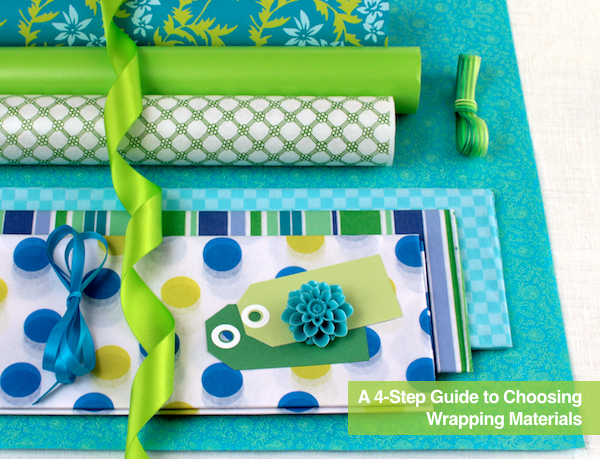 Choose one thing, whether it be a paper, a ribbon or a topper — any item that inspires you. Perhaps it speaks to you personally, or — even better — it’s appropriate for the occasion or “screams” the person you’re giving the gift to. Whatever you pick, it should be something that gets you excited. Once you have your keystone item selected, add other materials that complement it. As you choose each element of your packaging, look to the first item you selected for guidance; it should determine the theme, any motifs or patterns, the colour palette, and the style of your materials. Much has been written about colour theory, so I won’t go into detail here, except to say that it’s as important with gift wrapping as with any visual creation. Think about warm and cool tones, complementary and analogous colour schemes, and vibrancy and saturation when picking your palette. (Watch Karen Kavett's video "Intro to Colour Theory" for a good refresher. Karen is a bit of a character, and the video is aimed at graphic designers, but it explains colour theory nice and simply.) For inspiration, look to nature, artwork or websites like Design Seeds; they’ve done the work for you — just pick a palette you like and go with it. If you’re still unsure what shade goes with which hue, start with a patterned item like a floral paper, for example, and pull your colours from that. Just as an itsy-bitsy floral arrangement will get lost on a massive dining table, a tiny charm can disappear atop a big box. When combining various elements, consider their size in relation to each other; you want each to hold its own, without every piece competing for attention. For example, a thin ribbon can feel meagre on a large package, just as a wide one can overwhelm a small box. Finding a balance isn’t just about size, though — colour and contrast also play a part. A dark tag attached to a pastel-coloured package will have more visual weight than if the tag, too, was a light hue. However you choose your gift wrapping materials, though, always keep in mind that the absolute, most important thing is to enjoy yourself. After all, if you’re giving someone a present, you must be celebrating something!